Most of my readers and, I daresay, most of the men and women in the Charismatic Episcopal Church will have never heard of James DeKoven before reading this essay. That is a shame because, though he lived and died almost a century and a half ago, James DeKoven was a man for our time. DeKoven was a bit of a local hero in my seminary. Born in Connecticut and educated at the General Theological Seminary, the newly ordained deacon took a teaching position at the then fledgling Nashotah House Theological Seminary. Having been ordained priest the Bishop Jackson Kemper, DeKoven also took a position as the rector of St. John Chrysostom’s in the nearby Delafield. All of this endears him to me personally. As a Son of the House, we are steeped in the traditions of the school. There is a bit of a debate among my class-mates as to whether or not DeKoven was one of the figures carved on a statue in the library of the school, but, nevertheless, his name was mentioned often. I also had the pleasure of worshipping at the beautiful and historic St. John Chrysostom’s and their current rector was one of my professors. As I said, all of this endears him to me personally, but personal recollections alone rarely fascinate anyone else. James DeKoven, along with the achievements I have previously mentioned, was nominated or elected as a bishop in the Episcopal Church four times though he never was consecrated to the episcopacy. In the polity of the Episcopal Church, a group of delegates from both lay and clerical houses elect a candidate which must then be approved by the Standing Committee of the Diocese and then must receive consent from the House of Bishops. While elected bishop in Massachusetts, Wisconsin, Fond du Lac (Wisconsin), and Illinois, DeKoven was never able to attain the required consents. This was due almost exclusively to the fact that he was a “high church” ritualist. An Anglican Icon created by a religious order who has taken DeKoven as their patron. At a time when the mainstream of the Episcopal Church was rejecting incense, candles, crucifixes, bows and genuflections, DeKoven upheld the practices. 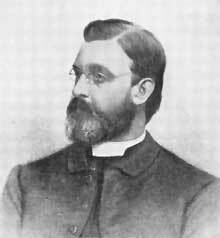 It was feared that he was a “closet Catholic,” a “crypto-papist,” and that his actions reeked of “popery.” The majority of the denomination had a wicked case of so-called “Romaphobia.” DeKoven’s adherence to his convictions cost him advancement in his career. Nevertheless, he refused to concede his beliefs and rather stood before the General Convention of the Episcopal Church and argued his point of view in both 1871 and 1874. For this House to forbid the use of incense is a very proper thing, perhaps; but for this House to say that the use of incense symbolizes false doctrines, is for this House to put itself in utter and total opposition to the Holy Scriptures; for, remember, what does David say? “Let my prayer be set forth in Thy sight as the incense, and let the lifting up of my hands be an evening sacrifice.” In other words, David says that the use of incense, to which that holy prophet and king was accustomed—having not lived in our own day—symbolized prayer; and will this church say—is it prepared to say,—that the use of incense, which symbolizes prayer, symbolizes false doctrine? Then again, I heard it read in St. Thomas’ Church yesterday morning at the beginning of the services, “From the rising of the sun even unto the going down of the same, my name shall be great among the Gentiles, and in every place incense shall be offered unto my name, and a pure offering; for my name shall be great among the heathen, saith the Lord of Hosts.” … Or again—and this is something more awful—when Aaron stood between the dead and the living with the censer in his hands, and the smoke of the incense was wafted to heaven; the people were saved. What did he typify but that Eternal Son of God who alone stands between the dead and the living, and whose mediation for the souls of men forever ascends to the right hand of God? and what did the ascending incense symbolize but the atoning Sacrifice and the everlasting Mediation? And is this Church then, prepared to say that the eternal Mediation and the awful atoning Sacrifice are false doctrines? Or, when the priest on the great Day of Atonement went before the mercy-seat, and clouds of incense covered it, typifying the ceaseless intercession of the Son of God, is this Church prepared to say that such a use of incense symbolized false doctrines? But this Canon, if it be passed as it stands, makes it so! And now, because I said “I believe in the Presence in the elements,” people held that I must believe in a local, physical, carnal Presence in the elements. Let me say that it is impossible for me to say in what sense I hold to a presence in the elements. Where Christ has not defined, I do not define. Where the Church has not defined, I do not define. I merely say negatively, as the Church has said that it is not by transubstantiation; that it is not by impartation; that it is not by identity of substance; and if you ask me how it is, I answer, I know of but one word to express it, and that word expresses it without defining it, and that word is the consecrated word “Sacramental.” I hold that Christ is in sacramental union with the consecrated elements, and that presence is called “real,” to show that it is not a mere figurative or virtual presence, and the presence is called “spiritual,” to show that it is not a physical or carnal or corporal presence. Having made these negative definitions, I declare that I hold that Christ has ascended into the heavens, and is set down on the right hand of the Throne of God. I hold that around Him are the Angels and the Powers and the Principalities, the Cherubim and Seraphim, and that the hymn of praise to the Eternal King ever ascends; and I also hold that He is present in the elements by this way of sacramental union; and how both are true I cannot tell. I believe the one, and I believe the other… I hold that Christ is there [pointing to the sky]; I hold that He is here; I hold that He is there locally; I hold that He is here spiritually. So, that all being said, what has James DeKoven to do with the Charismatic Episcopal Church? Truth be told, in our Convergence Worship, we face some of the same challenges DeKoven faced. Unless our parishioners were reared in the Faith in a Catholic or Liturgical stream, they most like hear ritualism preached against. They may have even been taught so-called “Whore of Babylon” theology; they may have been told that the Words of Institution were mere “Hocus Pocus,” or that “written prayers” were vain repetition and dead things. We know that these accusations are untrue. We know the charges are false. It is our job to eloquently teach the truth to our people. It is our task to show them, through sound scripturally-based propositions, that what we do is neither vain nor dead, but worship instituted by the Lord and enlivened by the Holy Spirit. In this our endeavor, we find an exemplary role model in Blessed James DeKoven. 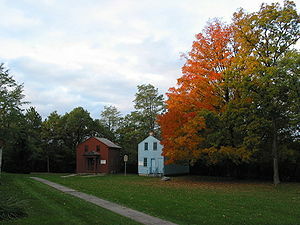 Two of the original buildings at Nashotah House. Both would have been present during DeKoven's time as faculty. Almighty and everlasting God, the source and perfection of all virtues, who inspired your servant James DeKoven to do what is right and to preach what is true: Grant that all ministers and stewards of your mysteries may impart to your faithful people, by word and example, the knowledge of your grace; through Jesus Christ our Lord, who lives and reigns with you and the Holy Spirit, one God, for ever and ever. Amen.